What sets VIMS apart from other systems are the features that allow you to manage your volunteer personnel from one centralized system. All of the standard modules listed below are included with your monthly VIMS subscription. Hourly Reporting: This feature allows your personnel to log and view their hours and activities performed from any web connected computer or device. They can view reports to easily see their total hours logged, as well as the amount of times a certain activity was performed. This feature also allows individuals to track miscellaneous items such as vehicle mileage and expenses. Scheduling, Calendar & Email Notifications: This feature gives you the ability to post and schedule events, and reserve resources via a feature-rich, integrated calendar and scheduling program. Administrators can easily fill volunteer positions for an event by sending out a request to all personnel in the system using email and/or text, allowing them to schedule themselves for the event. Volunteers can sign up for specific tasks using the “Personnel Needs” function, so they know exactly what they’ll be doing. Our exclusive “One Button Buddy” feature lets your personnel request a shift partner with one click of a button. VIMS allows event creators to “repeat” events, such as monthly meetings and multi-day functions, and save ongoing events as templates for future use. The color-coded calendar allows the administrator, as well as the volunteers, to see at a glance if there are any events in the month that are not yet filled or if they have signed up to work. Administrators and users can view and print their own schedules and a list of upcoming events and shifts in several different formats. Each event or shift may also be viewed or printed on a summary page that includes headshots of all personnel scheduled to work, easing the burden of having to identify everyone that should be there. Personnel Manager: With this feature, administrators can view, edit, and search pertinent personnel information, such as home address, email address, telephone number, emergency contact information, date of hire, headshots, or any other statistical data you choose to gather. User registration pages can be customized to display only the information you want to see, including self-defined categories, such as certifications, foreign languages spoken, or special skills. Our powerful search function allows administrators to easily and quickly locate personnel within your organization with the needed skills during times of emergency or need. The “Personnel Actions” feature allows administrators to record volunteer actions and rate them as positive, neutral, or negative, as well as to log any awards received or equipment issued. When personnel leave your organization, you can remove them from the active roster and archive all of their information into a separate “deleted users” page for quick access to that information or to reinstate them with one click of a button. You’ll never lose your personnel’s information. Some other systems charge an “archive” or “storage” fee for inactive users in their system. VIMS does not, and your inactive users do not count toward your user count fee. Training Manager: This fully integrated module allows you to enter all of your training classes and set up each one to show when it is required to be taken and how often it is to be repeated. You can easily view reports to alert you to upcoming or past due dates to ensure compliance and reduce your agency’s liability. Prospect Tracking: Record prospective new members in the Prospect Tracker module so you don’t lose good candidates. Track the status of each person by viewing their progress in the “hiring” phase and log notes, such as how they learned about your agency, who referred them, and any prior experience. Recognition Tracking: Never miss recognizing or awarding your volunteers by tracking their hours, months, and years of service. This feature also allows you to automatically send a semi-customized email to your personnel on their birthdays and/or year of service anniversary to let them know you care and are thinking of them. Forms Distribution: Post standard forms online in one secure and centralized location to easily communicate needs and information within your organization. Documents like newsletters, training manuals, policy manuals, and maps can all be accessed with one click! Reports Module: The feature-rich module allows administrators to generate any number of standard reports in both text and graphical format, or customize their own reports that may be exported to Excel. Additional reports include lists of events individuals worked, snapshot reports of future upcoming events with number of personnel required versus signed up, last dates of each users’ login, demographic overviews of your personnel, and much more. Group Emailing: Send external emails to all, some, or one of your volunteers directly from the VIMS admin module. There is no need to maintain a separate email group distribution list. This feature allows you to contact volunteers from anywhere, at anytime, from any web-connected device. With VIMS’s multi-level setup, individuals only have access to the data you allow them to see. Level Three: For the organization’s overall manager or supervisor in charge of all the personnel in VIMS—the “Super Admin.” The Super Admin has all the access of Level Two, but can also add, edit, and delete other admin accounts as needed. Optional Level Four: The “Headquarters” view is for agencies having multiple volunteer units at multiple locations. 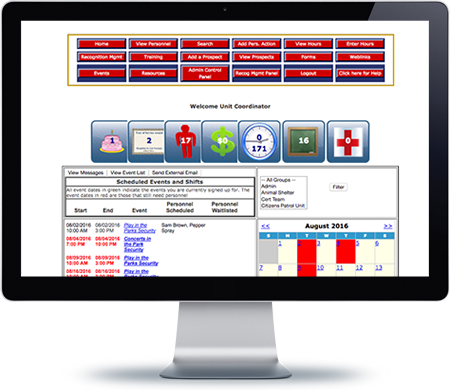 Individuals with Level Four access can view all volunteer data within the VIMS system for their entire agency. VIMS clients using the “Multi-Station” version would have this access ability. Smart Groups: The Smart Groups feature allows for the grouping of individuals, units, squads, stations, etc., with as many administrator accounts as your organization needs. You are not charged extra for additional admin accounts in VIMS, unlike in other systems. VIMS was proudly developed in the United States, where all of our servers, support team, and your data remain. In addition, your data is backed up daily to a separate U.S. data center. Each system has an individual login screen protected by a unique, user-selected user name and password to safeguard your information. All VIMS client sites are protected by the latest SSL certificates to ensure all your data is encrypted between your site and our servers. Our data center is staffed 24/7 with a team of highly experienced network technicians to monitor our servers, ensuring you always have full access to your data, while securing physical access with biometric access control systems and more for authorized personnel only. VIMS was developed on the most widely used database program in the world and programmed using industry standards, to ensure your data is never compromised by the use of a proprietary system. We conduct regularly scheduled security audits by a third party to further ensure your data is protected to the highest level. Our staff programmers attend annual national training software conferences to keep up-to-date on the latest software development tools and methods in addition to “future proofing” our systems from any coming changes in the industry.